This is M 17, the Omega nebula, also called W 38, the Swan nebula, and the Lobster nebula among other names. This nebula is found in the Ser OB1 association. M 17 is ionised by an O4V-O4V double star system (Kleinmann's star) at the core of the massive young cluster NGC 6618 (about one million years old), which contains over 800 stars, including 2 O5V star systems and 100 stars hotter than B9 (by comparison, the Orion nebula contains 8 stars hotter than B9). The total ultraviolet flux is about 25 times higher than for the Orion nebula. A large part of the nebula is hidden by a dark dust lane that runs near the central cluster and splits the main visible nebula (Gum 81a) from two attached nebulae on the other side of the dust lane (Gum 81b - IC 4706 and IC 4707). M 17 is a blister on the side of a much larger giant molecular cloud and star formation region (M 17SW) that contains 30 thousand solar masses of molecular hydrogen. You can see a more detailed image of part of this massive star formation region and view a good overview of this entire region. Gum's coordinates for the M 17 region are inaccurate but it is clear from his description that Gum 81a and Gum 81b actually identify the two parts of M 17 (with the dust lane between). M17 SW contains a strong infrared source called the KW object. This is now known to be two close and hot B stars surrounded by a cluster of 150 dimmer stars, deeply embedded inside M17 SW in an infrared reflection nebula. Kleinmann's star is a double O4V system with a combined absolute magnitude of -6.8. There are two other stars (called #2 and #3 in this paper) that are O5V in the surrounding NGC 6618 star cluster. The brightest spot of the main molecular cloud, M17 SW, is located to the south west of the visible nebula and is about 3 times larger than the entire Orion cloud complex. A second bright spot in the northen part of M17 is also larger than the Orion complex. Both of these bright spots are part of the same molecular cloud at a velocity of -20 km/s, which contains more than 30 thousand solar masses of molecular hydrogen. 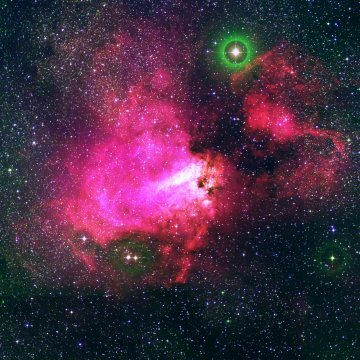 Star formation is occuring in both the northern and SW bright spots as well as in the nebula. Intense radiation from M17 has destroyed essentially all of the molecular cloud in the immediate vicinity of the nebula, leaving only ionised or atomic hydrogen. The ultraviolet flux from M17 is about 25 times higher than for Orion. 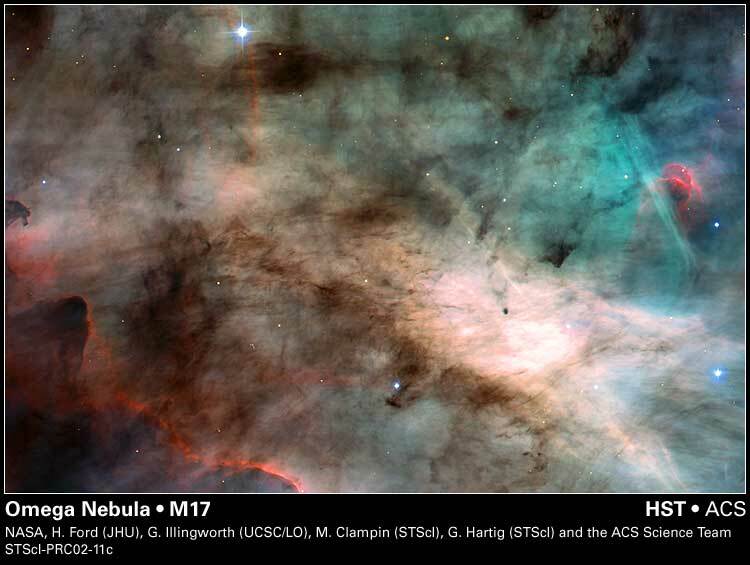 A second molecular cloud at -23 km/s with about 2000 solar masses of molecular hydrogen sits in front of M17 and is far enough in front that it is not torn apart by the radiation. The two bright stars in the cavity below the nebula are the B class hypergiants HD 168607 (B9Ia) and HD 168625 (B5/B8Ia). They are about the same distance as M17 and apparently associated with SGR OB1. The O4-O4 core system is called Kleinmann's star. There are 100 stars hotter than B9 in the cluster - by comparison, Orion has 8. M17 is ionised by an O4-O4 double star system at the core of the massive cluster NGC 6618, which contains over 800 stars.